Among all of your curly friends, you’re definitely the hair aficionado. You know all about curly hair, from distinguishing between different hair types to using the lingo such as no-poo, co-wash, ACV and twist-out correctly. You follow the best curly-haired blogs, and you have made a name for yourself on Facebook groups devoted to those with curly hair. Bottom line: curly hair is more than just what sits on top of your head. For you, it’s truly a passion, and you love educating and helping others with curly hair. If this describes you, try making some money from all of your knowledge! One thing we curlies are always looking for (unless we’ve found one already) is a stylist who really KNOWS curly hair. We’re not very interested in stylists who THINK they can handle what we bring but who would turn us into a triangle head. That said, we curlies would LOVE to have more in-the-know curly hair stylists available! A good stylist does more than just cut and shape hair, though. This means that in addition to knowing how to work curly hair, you need to be able to know — based on a woman’s personality, shape of her face, the clothing she wears, etc. — whether or not a particular style will suit her. Unfortunately, because so many stylists simply aren’t familiar with working with curly hair, curlies (especially coilies) have to teach themselves how to care for their hair. With all that you’ve done to research how to best care for your hair, you’d be a great asset in the world of hairstyling! But how do you become a curly hair stylist yourself? You probably have a string of questions about how to become a stylist. A good starting place to go for the answers is the Beauty School FAQ at Beauty School Advisor. There are detailed answers to common questions you might have about Beauty School. After getting some of your burning questions answered, you should start to research cosmetology schools in your area. To find out what schools are in your area, you can do a quick search on Beauty School Advisor. From there, you will have a good place to start in further researching each school. You can use this resource to look at what some schools have to offer and what kind of training you can get there. Does the school pride itself in offering courses on how to be a nail tech or esthetician as well as a stylist? That could be a plus if you are interesting in taking on multiple specializations. Make sure that the school offers what you want to specialize in and that it is accredited. 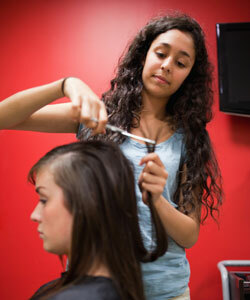 Most beauty-school programs last the length of a regular school year: nine months to a year. While this may seem like a long time if you were expecting to receive a license in a few months, keep in mind that a lot of the time spent in school will be hands-on. You won’t just sit and read from or be lectured from a textbook all that time! This is meant to prepare you to become a licensed stylist. Beauty School Advisor has a list of each state’s licensing information so that you can find out what the requirements are in your state. You may be concerned about how you will pay for school. The good news is that you may be able to get federal student aid if your school accepts it. You can find a list of helpful links about financial aid on that handy BeautySchool FAQ page under “How do people pay for it?” If you’re hoping to be able use Pell Grants or Stafford Loans (both very common for higher education), you’ll need to fill out a FAFSA and include your school’s code on the form. Once you’ve completed training and have a license, you may need to enroll in some extra courses that offer specific training. You can do another search on Beauty School Advisor to find schools for specific specializations, such as facialist schools, esthetician schools, electrolysis and even just general continuing education schools. Keep in mind that even after you become licensed, you should to continue to build on your knowledge to give yourself a competitive edge. Attend as many hair shows, workshops and hair events as you can. Doing so will give you guidance, keep you updated on the latest products, help you learn new techniques and provide the opportunity to network which can produce some amazing job leads! Typically, a stylist makes around $26,000 annually. Salaries for stylists can be greater or less than that average amount depending on several factors, including location, whether you work for yourself of for a corporation and the types or variety of services you can provide (this is where those extra classes can help). Invest in every learning opportunity to hone your craft and you will be able to make your passion into something you get to work with everyday and get paid for it! Do you want to turn your passion for curly hair into something more?